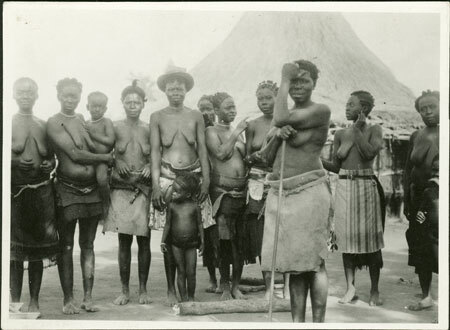 A standing group of wives and daughters of Prince Rikita (some identified), many wearing agbaya, some of them of textile, ramu. It is uncertain which name noted on the print reverse refers to which woman, but the woman carrying the boy is probably the one identified as dia Rikita i.e. a wife of Rikita, and the boy wiri Gami i.e. a son of Gami. Contemporary Publication - Reproduced as Plate 7. (facing page 111) in E. E. Evans-Pritchard's Man and Woman among the Azande (Faber & Faber 1974), with the caption "Daughters and Wives of Prince Rikita"
Notes on card mount m/s pencil - "SS overall (worst LHS edge & upper) "from right to left 1. Nølizgbi 2. Nstugyaba (Badija Kem(n? )azza) 3. Negizugi (Badija Brluro)(?) Extreme left die bikita - wila(?) gaami(?) 8.89"
Morton, Chris. "Wives & daughters of a Zande prince" Southern Sudan Project (in development). 03 Jan. 2006. Pitt Rivers Museum. <http://southernsudan.prm.ox.ac.uk/details/1998.341.224.2/>.